Today we see someone else on the run from the Wraith and then Dr Daniel Jackson returns to Atlantis. We start with Sheppard finding Meredith going off-world on his day off, a trip that just so happens to include Keller, only for Meredith to find that Ronon has also just so happened to volunteer on his day off as well. It turns out Keller is currently treating a village that’s come down with the flu where she son sends the two away to give patients privacy. This turns out to be a mistake however when she goes missing after treating patients while Meredith and Ronon are busy eating at the local pub. While Ronon follows their tracks Meredith goes to call in for backup from Atlantis. 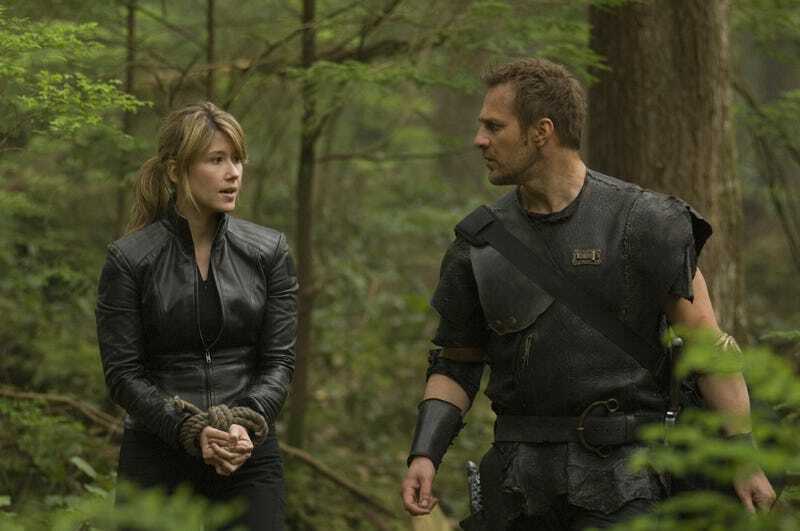 In the woods Meredith reaches the Stargate only to find Wraith dialling in before giving his position away leading to one chasing him into the woods only to be saved by a timely appearance by Ronon. Ronon quickly identifies the Wraith as those who hunt down Runners, meaning there must be one on the planet. Elsewhere it turns out that Keller’s been kidnapped by an unknown man who refuses to answer her questions about who he is. When they come to a stop they’re ambushed by one of the Wraith only for the man to use some kind of device to turn invisible and appear behind the Wraith before cutting his head off. Keller attempts to run off but is stunned by the man. When she recovers he reveals himself to be the Runner the Wraith are after. Keller attempts to convince him to wait for the others of her team as Ronon is an ex-Runner but the man refuses to believe there’s such a thing. When they come to a cliff the Runner reveals that the device is a short range teleporter when he transports the two to the top of it. Further behind Ronon and Meredith continue to follow the Runner’s tracks finding that he’s leaving traps behind him as well as decoy routes. The Wraith soon catch up again when Meredith needs to remove a stone from his shoe. While Ronon is angered at the constant stopping Meredit is able to retrieve the tracking gauntlet from the dead Wraith which allows them to pick up the pace. Up at the front Keller once again attempts to convince the Runner to let her remove his tracking device like Beckett had done with Ronon. While the man agrees to it Keller finds that the saving of Ronon has meant the Wraith altered the trackers and now can’t be cut out without killing the Runner. By nightfall the pair finally arrive at the Runner’s hideout where he reveals he’s got a sick young girl with him, Celise, who was from a village that was culled when he stayed too long. The Runner leaves Keller to take care of the young girl who eventually wakens, asking for Kiryk. The girl claims that Kiryk has taken care of her and just pretends to be cold which Keller says reminds her of a certain member of the Expedition. When Kiryk returns Keller says Celise needs better treatment on Atlantis to save her but they’re interrupted by multiple Wraith who manage to stun Kiryk and the lone survivor attempts to take Celise before Keller kills him. The next morning Kiryk wakes up to find that Keller had to carry Celise and then drag him to a new clearing to prevent the Wraith following them. Keller tells him that they could try using the medpacks defib to “shock” the tracker into breaking, though with the inherent risk of killing Kiryk, which he agrees to as long as Celise is taken care of regardless. The plan works in destroying the tracker but Keller is barely able to revive him following it, finding that the teleporter is no longer working either. The group begin to make the trek to the Gate when Meredith and Ronon show up, with the two ex-Runners immediately fighting until Keller stops them. At that point however heavy Wraith reinforcements show up to find out why their Runner has disappeared. The group decide to work together on taking the Gate, taking out a group of Wraith on the way, and find the Gate relatively unguarded. With Meredith having “fixed” the teleporter Kiryk uses it to assault the Gate only to get pinned down when it stops working. Stuck at the DHD he chooses to dial the Gate and lead the Wraith away to places unknown thereby allowing the others to make it to Atlantis. Back on Atlantis Celise makes a full recovery in the infirmary where, with Kiryk still MIA, Celise is placed with a family who are willing to take her in on one of their trading partner worlds. In the training room Meredith and Ronon agree not to fight over Keller and instead let her choose who she wants to be with, shaking hands on it. This is one of those episodes that has that annoying tendency of Stargate to create a one-off character that really deserves a second look-in but sadly never got one. The main story revolves around the Runners, the humans the Wraith use as a form of blood sport, which had previously only really been talked about in relation to Ronon’s introduction. With the introduction of Kiryk it’s clear the Wraith go for a certain type of person to use as sport, likely military individuals who’d have the skills to make the game “interesting”. Even though he only appears in a single episode Kiryk gets a surprisingly large amount of exposition that took almost a season to get with Ronon. We find that not only is he a skilled fighter but also a human side that refused to leave a sick wounded child alone in a culled settlement, even though he knew taking care of her would slow him down just enough the Wraith might catch up. Admittedly much of the character is a clone of Ronon, who also had a “stayed in a village too long” story in season three, but there’s just enough different to make it fresh and interesting when the two meet. I guess there might’ve been another appearance in season 6 if they had one but it’s a shame it now leaves a massive plotthread hanging that’s never answered. Elsewhere an annoyingly large part of the episode focuses on this utterly pointless love triangle regarding Keller, Ronon, and Meredith. While Ronon and Meredith have butted heads in the past comically here it just begins to feel annoying because of the context of this “competition” to get the girl. It’s a fairly boring and overused trope even at the time and in retrospect really is a disservice to the characters given how it gets wrapped up so quickly in the same season. Maybe it was an attempt to create tension between characters who really didn’t need any tension to begin with and as a result just feels like yet another bad plot idea dropped when it didn’t go anywhere. The episode also makes reference to yet another advanced civilisation that exists somewhere in Pegasus and it seems more and more of them have been referenced in the last few episodes. Maybe, just like in SG-1, the more advanced planets would’ve soon been introduced again if there was a season 6? Overall though it’s an interesting little episode that further explores an element of the show that long stood untouched with a well-rounded one shot character who it would’ve been just as good to explore further. · Meredith really is useless at walking in the woods. · That must’ve been a quick build death trap despite no digging tools. · After 4 years Meredith still can’t load an M9 under pressure? How is he even allowed off-world? The base is prepping for a visit by an important scientist from the SGC who Meredith doesn’t seem to want to meet. In the control room Meredith and Sheppard meet with Woolsey just as the visitor is beamed down, one Dr Daniel Jackson. It turns out Daniel is there to look for hidden research belonging to the Ancient Janus, the man who invented the Time Jumper and helped an alternate Weir save the Expedition. Journal entries from other Ancients suggest there’s a hidden entrance in a hallway somewhere. Elsewhere on the base Sheppard is trying to get Woolsey to let him join Woolsey when he goes to Todd’s Hive, intent on negotiating the next step in Keller’s viral/gene treatment regarding feeding, via the Daedalus. Ronon decides to join Keller on the trip claiming a lack of trust with both the Wraith and the Daedalus crew. On the lab hunt the pair of scientists soon find the supposed entrance and gain entry via a series of coded lightswitches. Unfortunately on another world a second lab is activated when they enter the one on Atlantis, alerting a group of unknown aliens. Soon Atlantis detects an unknown ship inbound that manages to go straight through the city shield and stops above the lab, unloading its armoured crew who cut through to the lab. The three aliens quickly stun and capture both Meredith and Daniel before taking the object linked to their own computer before departing, one of them being killed by a security team in the process. After the others go the team attempt to cut into the suit of their dead intruder only for it to detonate. At the location of Todd’s Hive the Daedalus arrives on its mission, with Woolsey having his speech shortened considerably by an impatient Todd. Keller and Todd soon begin looking at the virus to see whether it’s ready for live trials but Todd is sceptical, relaying fears that while it has benefits the loss of what was their core drive leaves the Wraith without purpose. On an unknown snow covered Ancient outpost the unknown aliens place the two scientists in a sealed room with nothing but a console and the device they took from the lab, clearly expecting Meredith and Daniel to get it working. Soon Meredith works out that the machine was Janus’ “endgame”, a way to stop specific races’ hyperdrive tech from working, but was stopped due to “unforeseen side effects” that he didn’t record. The two attempt to get the unknown aliens to listen to reason but it doesn’t work and instead force Meredith to turn the device on. Onboard the Daedalus Todd receives word that an alliance facility is under attack from hostile Wraith and decides to send two cruisers to go and intervene while Todd and the Hive stay. As the two cruisers attempt to jump to hyperspace they’re torn apart, causing Todd to blame the Expedition having used the “Attero Device” before a hidden stun weapon to knock out the ship’s bridge crew. Todd takes control of the Daedalus and begins bringing his Wraith aboard. Back with team science Meredith finally finds what the “unforeseen side effect” was but is unable to shut down the device before he can stop it. On Atlantis Sheppard and an assault team attempt to use a Jumper only for the Stargate to begin building up a massive power charge. Sheppard has them put a shield around the Gate itself as they can’t stop the buildup. The tower begins evacuating but the explosion continues while Zelenka and Sheppard try to keep the shield up as long as possible only for an explosion to take out the control room. So here we have the start of the final two parter of Atlantis and it really was a fantastic start of a story that sees a longtime veteran of the franchise make their comeback. The introduction of Daniel onto the show really quickly feels like he’s been there all along, with the longtime character immediately starting a mostly friendly rivalry with our resident science genius. The partnership between the two does remind me somewhat of the latter days of O’Neill and Daniel with the two routinely annoying each other for friendly fun rather than any anger as we see the two easily working together despite their outwards annoyances. That doesn’t stop the childishness however, with a memorable “getting back” scene with Daniel not warning Meredith of an electric fence to get back for falling back on his face earlier. Again like many times with the franchise it’s a damn shame this is only a temporary partnership given how great it feels to watch right from the outset but we can’t have it all. Elsewhere we see Todd return as part of the virus/gene therapy subplot and outside of that annoying wrinkle of the virus reappearing again (enough with the viruses already) we see a surprising amount of doubt and anger from the Wraith this time around. On at least one level it’s clear that Todd does understand why the galaxy sees the Wraith as monsters but he also fears what they’ll become if they do leave that part of them behind. Until now the Wraith’s existence has been defined as population control in terms of survival but with the therapy this means that the old system of Wraith alliances will break down as feeding grounds are useless while humans will no longer be hunted down by the Wraith. This doubt soon turns to rage however when he fears that the Expedition, people he’d come to trust if not regard in some ways as friends, have deliberately betrayed him to simply kill more Wraith. Even then however you still see some semblance of not wanting to be harsh with them yet, keeping the entire crew unconscious and alive rather than turning it into a blood bath like he could’ve easily done. As we’ve seen time and time again one of the most human characters on the show ended up being a Wraith. Also we have the action subplot with the city itself coming under attack, the first time in years now that the city itself has been invaded, but it’s a damn good one as this unknown group easily bypass all its defences for some tight quarters gunfire before a few explosions later on culminating in the whole control room going up in a fireball. These sequences have been rather few and far between as of late but it’s always good to watch the tension they create with well put together cliffhangers. Even with all the action in the episode there’s still time for quite a lot of humour. Outside of the Daniel-Meredith arguments there’s also Woolsey making a reappearance in a couple of fun scenes, with him worried about what Sheppard will do to the city while he’s away and then putting god knows how many hours into a speech only for it to be ruined by Todd’s rush to get to work. Again his straight man routine really stands out in the show from everything else. First Contact is a great episode of a two-parter that sees old friends return, galaxy wide threats to beat, allies at odds with each other, and a load of fun to be had all the while. · Out of the original SG-1 I’m surprised it took Daniel the longest to crossover to Atlantis. · So much VFX for moving around the city. · The Ancients really did leave a lot of crap lying around before fleeing.